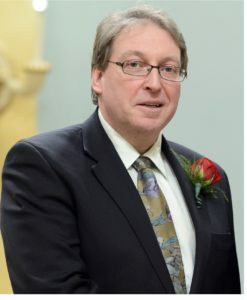 Professor J. Paul Santerre has published >160 peer reviewed publications and is a listed inventor on >60 patents in the area of polymers, biodegradation, surface modification and drug delivery. He was formally the Associate Dean of Research in the Faculty of Dentistry (2003-2008) and Directior for the Institute of Biomaterials and Biomedical Engineering (2008-2013). He is a co-founder of Interface Biologics Inc (formed in 2001 with medical technologies being sold and developed in Canada, Europe and the US) and currently the director for Physical Science Faculty in Techna at the University Hospital Network/University of Toronto. He has been appointed an International Fellow of Biomaterials Science and Engineering (FBSE) (2004), a Fellow of the American Institute for Medical and Biological Engineering (2009) , a Fellow of the American Association for the Advancement of Science (2011), and a Fellow of the Canadian Academy of Health Sciences (2013). He has received several awards for his innovation and industry related activity including the Julia Levy Award from the Canadian Society for Chemical Industry for translation of knowledge to product, the Natural Sciences and Engineering Research Council of Canadas Synergy Award in 2012, and the 2014 Manning prize (Canada’s top Entrepreneurship/Innovator award). He was the president and organizing co-chair of the Montreal World Biomaterials Congress to be held in Montreal, Canada, May 17-22, 2016. Physical/surface/biological characterization of polymers, novel biomaterial development, drug polymers, material biodegradation, tissue engineering, medical device manufacturing.